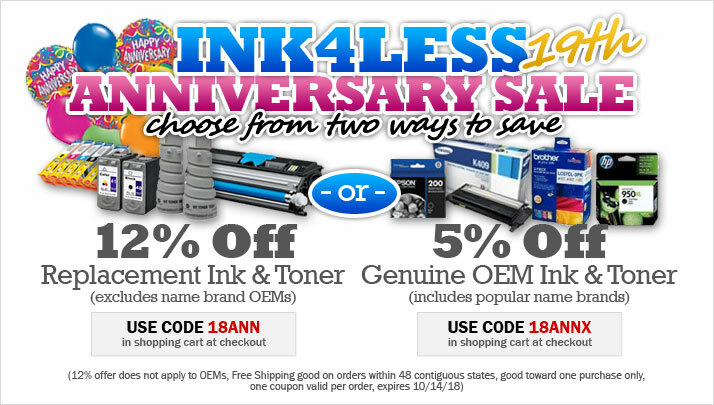 Celebrating 19 years of providing quality ink and toner at great prices. Shop Ink4Less.com and save 12% on remanufactured and compatible replacement ink and toner (does not apply to OEM cartridges). All orders over $49 automatically qualify for free shipping. Some restrictions apply. Discount does not apply to OEM products, Free Shipping good in 48 contiguous states, good towards one purchase only, cannot be combined with any other offer. Offer available Friday, October 5th 2018. Expires Friday, October 5th 2018.